My husband and I are planning a trip to go visit our oldest daughter and her husband. They live in Las Vegas which is one state away from us. We considered flying there but for five of us it would cost $1200 so we decided that driving would be our best bet. My husband and I would rather save money on traveling so we can have more money for fun while we are in Vegas. Not gambling fun but rather going out to eat and sight seeing. I know flying would be so much faster and enjoyable but I just don't want to spend that much money. Since I am not one who travels well by car, I always make sure that the boys have plenty to keep them entertained, that way I can sleep or maybe work on the computer while my husband drives. I am glad my husband likes driving. So here are some things that I like to pack for our road trip and some ideas to make the time on the road more bearable. 1. Sleep In Comfy Clothes I have my boys sleep in sweat pants so all they have to do before we leave is go potty. It also helps to have them put their shoes in the car so no one forgets those. One trip my husband forgot that he had his slippers on. Thankfully he discovered he had no shoes before we got onto the highway so we were only a mile away from home. 2. Leave Early In The Morning I like to leave about 6 AM as the roads are not busy yet and we can get on the highway before the rush hour happens. I know some parents leave early as their kids will sleep for several hours. My youngest are 8 and 10 so they don't sleep in the car but I try to as I am the one who hates car travel. 3. Bring With Coffee And Breakfast The coffee is for the grownups, of course, as it helps the driver be alert and coffee just makes everything enjoyable. I just love sipping a warm cup of coffee while traveling. I like to pack breakfast burritos or bagels. I make everything the night before and just warm it up in the morning. 4. Bring With Movies My boys can be entertained for hours with movies and this keeps them somewhat quiet, they tend to laugh loud at their movies. The day before we leave I let the boys choose several movies from Redbox. I also make sure there is a Redbox near our hotel to be able to return them once we arrive. We bring with our portable DVD player and dad's laptop so the teen can watch his movies while the younger boys share the DVD player. Of course bring headphones! I just love Buddyphones. 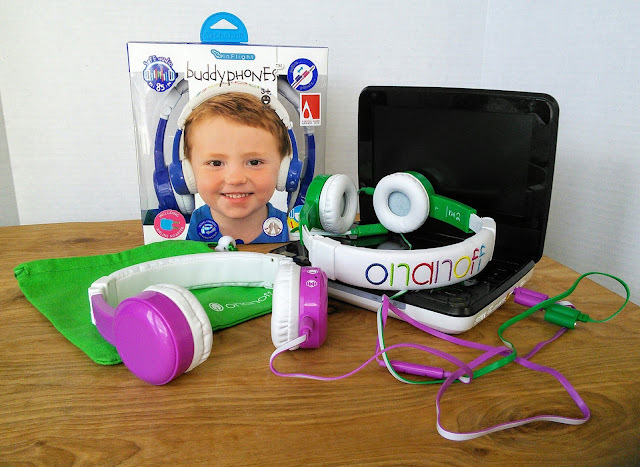 These durable kid headphones not only have volume control but they have this detachable BuddyCable system that allows up to four audio cables to connect to one device. That way all three boys can watch the same movie with their headphones. They also are made to fit little ears. I remember when the boys were small and the ear bud style headphones never stayed in their ears. The teen likes that they are adjustable so he can wear the Buddyphones. I even have a pair too so I can listen to music in the car. I love the included stickers so kids can decorate their headphones. 5. Bring Snacks The snacks are mostly for dad as they keep him happy. 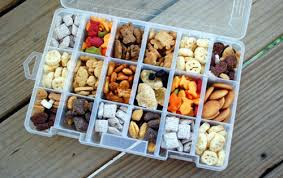 I like to pack items like dried fruit, cheese sticks, crackers, and homemade chocolate chip cookies. We also bring with a gallon of water and a reusable water bottle for every person. I also bring with individual drink mixes as sometimes the water in other cities does not taste the same as ours and a little bit of flavor encourages everyone to stay hydrated. Some parents like to use tackle boxes to make the snacks more fun for kids but my boys are not into that. I think a tackle box would be great for the Legos. Also, pack some wipes and trash bags for messes. 6. Bring A Travel Bag For Each Child I let my boys pack their own travel bag with items to keep them busy. I like the ones that go between the seat so items are within reach and organized. The ones that hang over the seat also work. My boys like to pack books, color pencils, paper, coloring books, Legos, and travel games. I also give the boys a baking sheet, that way they have a hard surface to draw on or build their Legos on. For younger kids, these are great for magnets. Window markers are also fun. The kids can draw on the car windows with these markers and they wipe off easily with baby wipes. My boys like to write things for other cars to see in hopes of getting another car or truck to honk! I remember as a kid trying to get truck drivers to honk. 7. Make Fun Stops I like to give the boys travel guides and maps for the states we are traveling through and too. That way they can see where we are and selected a couple of places to stop at like rest stops or other interesting points of view as long as they are not too far from the highway. It makes the trip go by faster if we stop and stretch our legs. Sometimes rest stops have playgrounds. We also have the boys make a list of places they would like to visit when we reach our destination. 8. Stop For Lunch Sometimes we pack food for a picnic lunch depending on the time of the year or we stop for lunch at a restaurant. I like to stop at pizza places if we can find one but if fast food is our only option, then I break the rules and let the boys eat a fun meal. Sometimes those meal toys can keep them occupied for a while in the car. 9. Bring A Pillow And Small Blanket These are great items to have to encourage kids to sleep, if not just rest. 10. Travel Bag Surprises Go to the dollar store and buy some fun items like stickers, candy, pipe cleaners, play dough, individual snacks, and so on. Wrap the items up and then each hour, give each child a present to open. For older children, you can label them with cities that you will be traveling through. Then when you reach that city, they can open the gift. 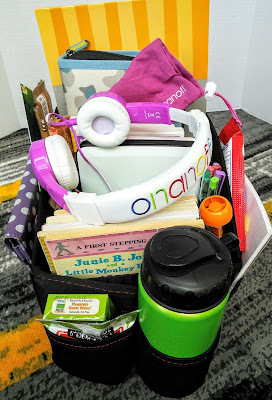 These are just some of my ideas that make car traveling easier with kids. I hope you can incorporate some of these into your next car trip to make it easier. I would love to hear your ideas on traveling with kids. What tips do you have for traveling with kids? "These opinions are my own and I received samples of Buddyphones from http://www.onanoff.com/ to facilitate this post." Such great tips! We live in the country so it seems like we do this all the time! But we are planning a big road trip this summer so this will help a lot. Those ideas are really good. My son is difficult when we go on a trip. Thank you for gave me these ideas for him!! Great snack ideas! 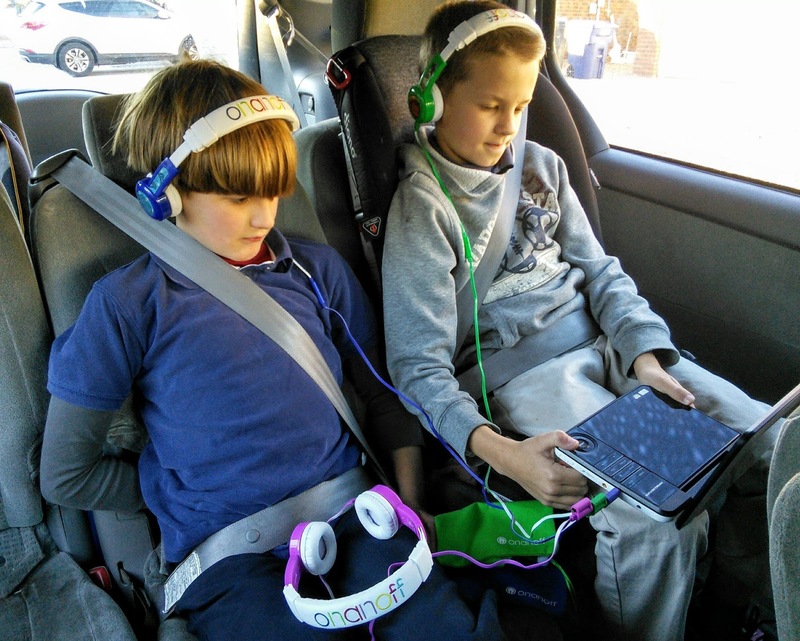 The headsets look perfect for the little ones to help the trip seem faster! We too prefer driving, especially with the lower prices of gas these days. Great tips. When possible, I like doing long road trips too over flying - but depends as Europe is rather large and petrol can be so expensive! These are great ideas! I always made sure my kids had entertainment on road trips and it usually always went smoothly. Absolutely love your little snack tray, ingenious! We used to drive 24 hrs from NY to Florida, and we picked the boys up from school & drove overnight which made the trip much more bearable so you might consider that. These are wonderful ideas. My youngest and I take a lot of road trips to Kentucky and he gets so bored on the 14 hour drive. I love the travel bag surprises. I think my son would love that the next time we take a trip! Moms always do the planning, all the stuff to bring that can entertain the kids and the foods to eat, the pillows. I am always glad to have a mom beside us. Road trips are awesome. Some of my fondest childhood memories are road trips with my folks. And they didn't even do a fraction of the planning and prep that you do. Your kids must have had a great time. It's always important to bring entertainment for the kids when you travel especially if it's a long flight or a long drive. I love these ideas, no kid will ever be bored when you have these for them! I love spending time with family. Especially on trips. Thanks for the ideas! These are all great tips for traveling with kids. I am done with this phase of parenting, as my kids are all grown ups now. I'm sharing this with my daughter and my cousins. They would benefit a lot from reading your post. I absolutely love the idea of using what looks like a medicine or bead box. I'd never thought of that. Thank you for the great idea! All excellent ideas! I wish I would have thought up all these when we did our road trip to Florida from Canada (26 hrs packed in a car, can you just imagine the fun we had - not!! These are brilliant! I may need to print these off for our spring/summer travels. Such a good ideas and perfect tips for the parents. My son had a hard time when we are on travelling. Great tips! My friend and I were just talking about things for a road trip! Traveling with kids is always going to to be so much fun as well as have so many hectic issues too. These are some great tips to make the best of such road trips. Having a personal travel bag for each of them is a good idea and we do always go for fun stops regularly! These are all great tips. Those headphones are something that I need to look into. ohh, this is an excellent idea. Its nice that each has its own bag. Road trips are fun when you have all you need. Great tips! I don't travel a lot but when I do I always make sure to leave super early in the morning to avoid as much traffic as possible. Such brilliant ideas!!! I do some of them but there are a few there I will definitely steal! Thx! Hi Tara, these are perfect tips for the parents who always travel with their kids or on occasional road trips.